I’d burned through another leather wallet again. The edges were worn, and the credit and ID cards within had established deep wear patterns in the leather. The stitching was coming loose, and it looked super shabby when I pulled it out in public. It was also thick, and despite periodically culling my wallet of crap I didn’t need I was still sitting on a bump. I decided to revisit my 10 year-old self and try a synthetic wallet. I read reviews about the thinness and durability of the “All-Ett” wallets and figured I’d give it a try. Over 14 months later, here’s my review. The billfold All-Ett wallet has a little plastic window for an ID card. The original All-Ett didn’t, and I get asked for ID with enough frequency I wanted the window. The left side of the wallet has two pockets for credit cards. The right side has one pocket for cards and the ID window. 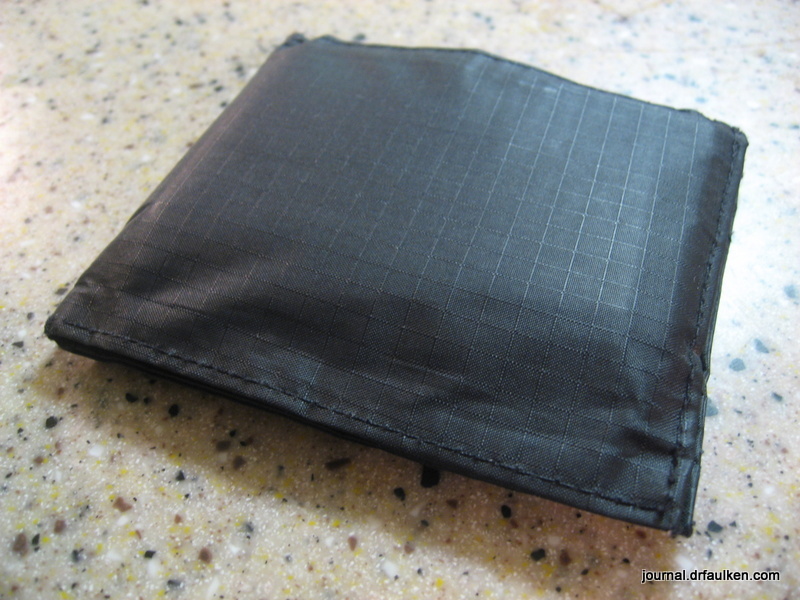 The billfold part of the wallet is divided in half by a thin nylon wall. I’d have to say the wallet is “average-sized.” I’ve had smaller wallets with only one section for cards, which were oriented vertically instead of horizontally. Of course, I’ve had larger wallets. I think my Dad still carries a tri-fold, which is roughly the size of a softball. Aside from that and the position of the cards, the construction and materials of the All-Etts are all the same. 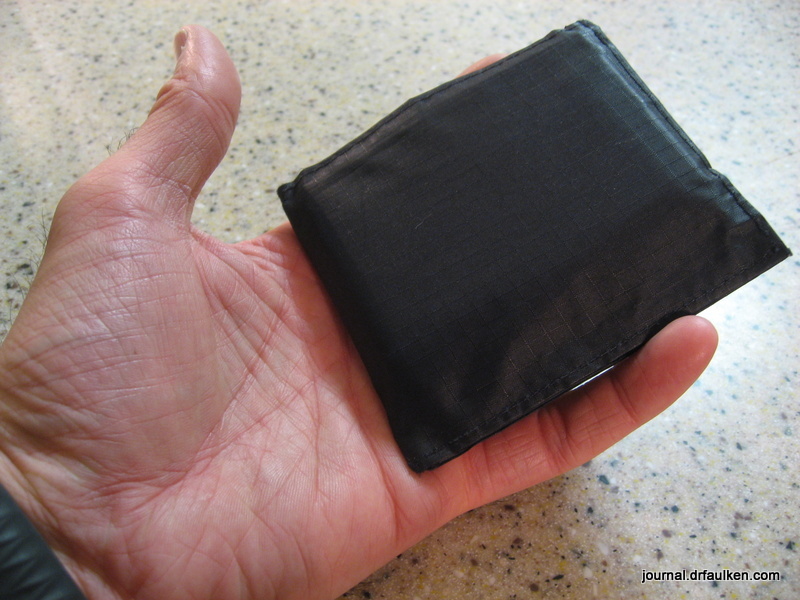 The wallets are made out of a lightweight, ripstop nylon that feels cheap and thin. The material itself has proven itself over time, but the stitching has not (more on that later). Fully loaded, my wallet is just over a half inch thick (0.52″ according to my digital calipers). I guess I could cut them, but I’m a touch afraid of doing so. 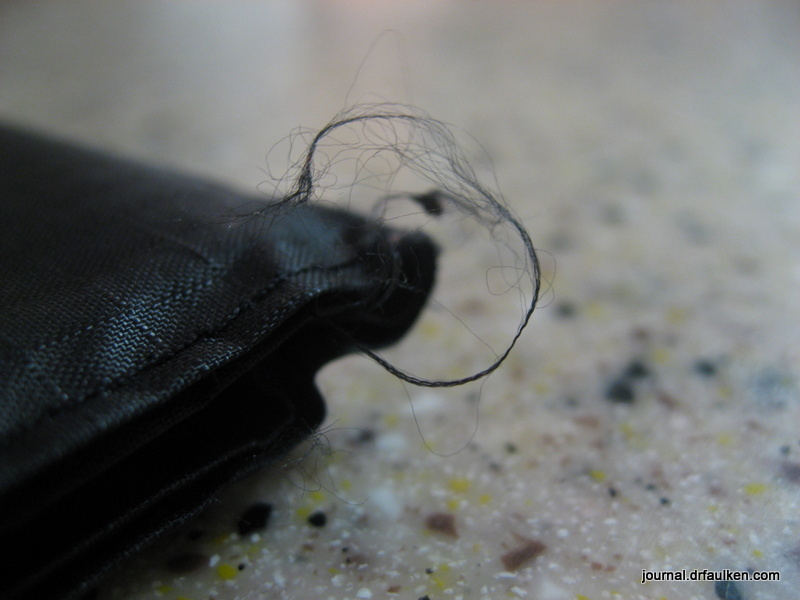 Also, if you’re the kind of gent to buy a nylon wallet you probably can’t be assed to trim loose threads. After living with the All-Ett for over a year, I’d say it’s an okay container for all of your crap. I’d like it a lot more if the threads held together better and the wallet was about $10 instead of $20. There’s a certain mystique about the All-Ett and its thinness, and while I certainly feel that the wallet is thinner than say a leather or ballistic nylon wallet I don’t think it’s worth paying $20 for it. 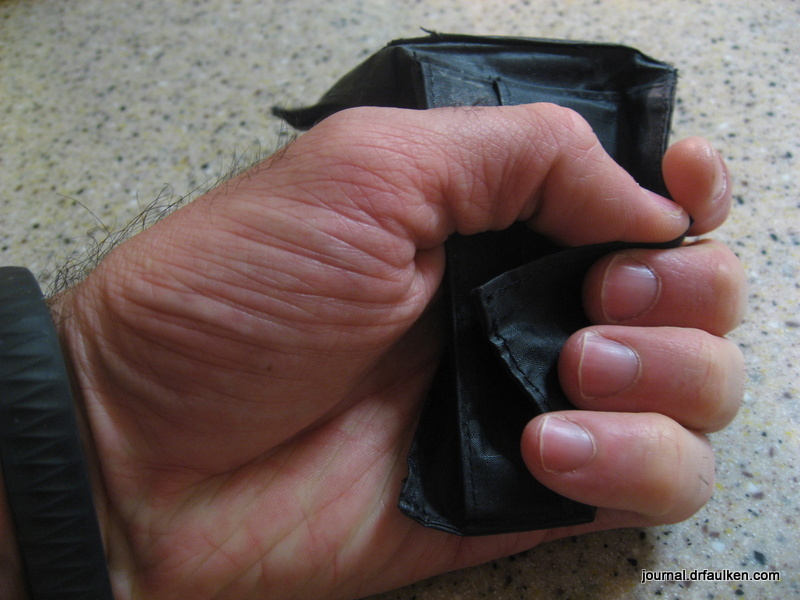 4 Comments on "All-Ett Black Nylon Inside ID Billfold Wallet Review"
I feel your pain. May I suggest a money clip carried in the front pocket? I ditched sitting on a wallet years ago for a clip. Can still carry a good number of cards, cash, no sitting on a bump, and looks classy as well. So much more comfortable. Cheers! Thanks to one of my readers who email me with the suggestion about burning the ends off, I will give it a try. I could have told you the same thing about the all-ett. I had one for a year and experienced the same issues. I switched to a similar one by bigskinny, and I like it a LOT more. I’ve had it for over a year now, and it still looks just like it did when it was new. It’s slightly thicker material, but not as thick as leather. So it looks better, and is much more durable. I have the bigskinny sports wallet, and that’s my recommendation. I recently went through a complete evaluation of the wallet market after using a Maxpedition Spartan wallet for many years. I originally got the Spartan because it advertised an external ID window. However, because the the ID window was black mesh, many people still asked for my ID to be removed, eliminating the benefit of the window in the first place. As a result, Maxpedition no longer lists the external ID window as a feature of the Spartan. After growing tired of pulling my ID from the Spartan, I ended up buying a Spec-Ops Brand T.H.E. (“Tactical Holds Everything”) Wallet and have been really happy. 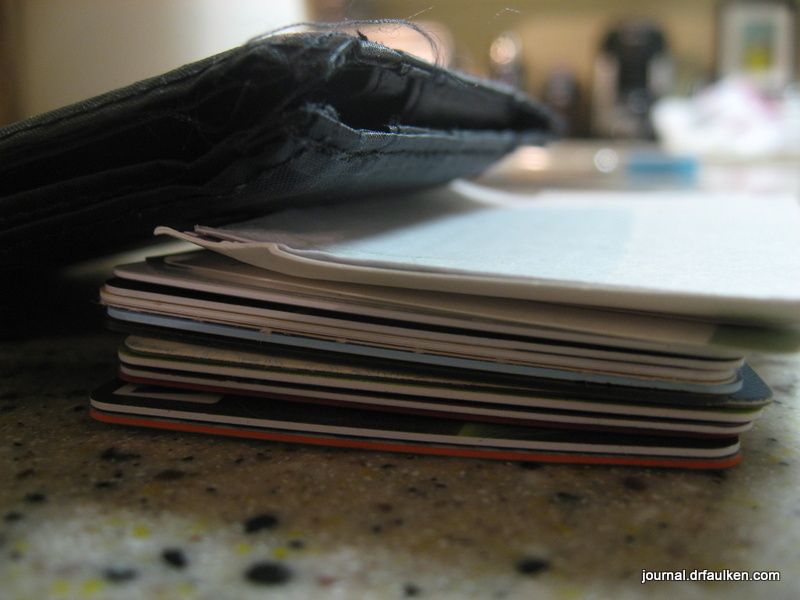 There is more room for comfortable placement of credit/other cards than any other wallet that I have ever seen. It has an inside and an outside clear ID holder, an integrated change carrier (that I thought I would never use, but do), two compartments for segregating bills/receipts (one zippered), and a special “Shark-Bite” _non-velcro_ (i.e., silent) closure, to keep everything together. It indicates that it will hold a passport (I haven’t tried this), and it has eyelets to allow it to be hung around your neck while traveling. The Shark-bite closure will also allow it to be affixed to your belt, but I have never used this either. It’s a bit of a chore to get used to (especially the Shark-Bite enclosure), but I am very happy with my choice. It’s a bit large, but fits in a standard rear jeans pocket without any issue. I find it to be very comfortable, as it seems thinner than previous wallets, because the contents are distributed over a somewhat larger area. If you’re concerned that it’s too big, you can try the smaller “junior” model. I decided to try the normal size, and am glad that I did. FYI, this goes in my rear left pocket and in my rear right pocket I carry a Maxpedition Micro Pocket Organizer with all of my EDC gear. FYI, I am not affiliated with either Maxpedition or Spec-Ops Brand, other than being a satisfied customer.